Since it’s Friday I decided to keep things lighter today, so I’m raising the question that’s weighing on everyone’s minds—what can we learn from monkeys? There are many important aspects of life from which we can gain questionable insight by looking at our fellow primates. For example, some monkeys can be very friendly, but usually they aren’t. That’s a lot like people, right? Movies love to portray monkeys as extremely intelligent beings that can learn to do what people do, and sometimes perform tasks even better than humans. For that reason, they are frequently perceived as being capable of critical thinking. But this is questionable—we have no evidence that monkeys know that other monkeys know. In other words, they don’t think about thinking as they are communicating. For example, when we have a conversation with someone, we are constantly aware of (thinking about) how the other person is receiving what we are saying, and at times we adjust our tone or choice of words accordingly. In fact, we may even determine to drop an argument because we don’t wish to upset the person to whom we are speaking. Apparently, monkeys don’t do that—they don’t know that others know. But to be fair, they still have a keen ability to communicate and learn—a trait that I can’t claim to have perfected. The first experimental monkeys of renown were those who flew in rockets to test the survival potential of space flight in the late 1940’s and 50’s. There were experimental monkeys before that—they just weren’t famous. There are also social similarities to humans. For example, some monkeys urinate on subordinates to make it clear that they are in charge. In many ways, corporate America has practiced symbolically similar traditions for many years. But there are many ways in which monkeys don’t resemble humans at all. In fact, it’s hard to believe that we even evolved from them—unless of course we didn’t. Unless, of course God really did create man from the dust and woman from man—because He is God—no monkeys needed. Unless, of course God managed to figure out how to make humans in their current form, and didn’t require us to develop from primordial goo over a period of 100 million years. Perhaps there is no hope for us, in that we still debate our own progress based on the evolution of man from monkey. I know that Darwin actually based his theory of evolution of man on apes, but I like the word monkey. I will have to admit, there have been individuals in my past whom have displayed characteristics and behaviors seeming to support the notion that we may indeed have evolved (albeit poorly) from apes, but I don’t know if that counts for anything. 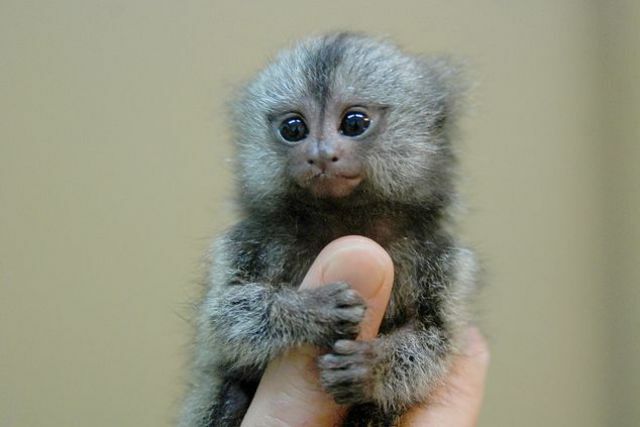 The monkey in the picture above is called a Finger Monkey, but is actually a pygmy marmoset. It really is that size–it is not “photo-shopped” onto someone’s finger, and it weighs only 3-5 oz. I have always wanted a big monkey. You know, a man’s monkey—like a knuckle-dragger Orangutan. But when I saw this little guy I thought he was so cute he might be worth a try. It would probably be expensive to feed an Orangutan, but a finger monkey barely eats enough to fill a thimble. So when I did a little research on fingermonkey.org, I was surprised to discover that these tiny guys cost from several thousand to twenty thousand dollars, sometimes more. In addition to that, if you feed him the wrong food, he dies. If you feed him too much or too little, he dies. If he gets too warm or too cold, lonely, depressed, ignored, or lost—he dies.